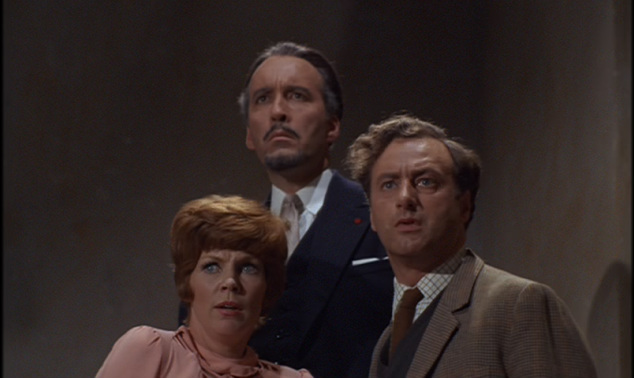 The Devil Rides Out holds a special place in the heart of every Hammer film fan. The classic visualisation of Dennis Wheatley’s bestseller of satanic goings-on in London’s Home Counties, was a hit on its first release and has remained so ever since. The Duc de Richleau (Christopher Lee) and Rex Van Ryn (Leon Greene) are concerned for their young friend Simon Aron (Patrick Mower). Simon has fallen in with a society led by the mysterious Mocata (Charles Gray), who exudes a sinister influence upon the impressionable Simon. When Richleau and Rex discover the occult practices behind the innocent face of the society, they realise the race is on to save Simon and his soul from a fate worse than death. Where Hammer stumbled in later years was when it became clear – as with their 1970‘s series of contemporary Dracula films which were horrific for all the wrong reasons – that the cast and crew no longer cared in what they were doing. Here however, its obvious the Duc de Richleau and his friends believe 100% in what they are up against and as a result so does the viewer. Of course with Terrance Fisher directing, and Lee and Gray leading the troops in front of the camera, the production has just the right degree of gravity to add to, yet not overwhelm a plot which races along at a cracking pace. The secret of The Devil Rides Out’s lasting popularity is that everything, despite the total preposterousness of the situations, is approached with such seriousness by all involved that the viewer cant help but accept it as well.